Cornell Lab of Ornithology researchers used weather-radar data to count the numbers of birds crossing the northern and southern borders of the United States in fall and spring. View larger image. Source: AM Dokter et al. (2018). Graphic by Jillian Ditner. From the Autumn 2018 issue of Living Bird magazine. Subscribe now. Fall migration will bring 4 billion birds into the skies over the United States. That’s not a guess—it’s hard data, gleaned from the first-ever national bird count using weather radar. Cornell Lab of Ornithology scientists picked through data from 143 weather radar stations from 2013 to 2017 to provide the first large-scale counts of migratory bird activity across the United States. 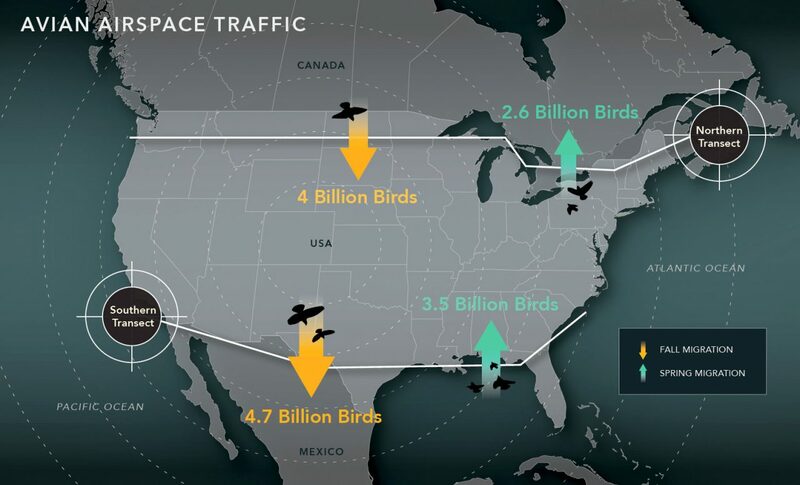 Their research, published today in the journal Nature Ecology & Evolution, provides a peek into how many migratory birds use American airspace. 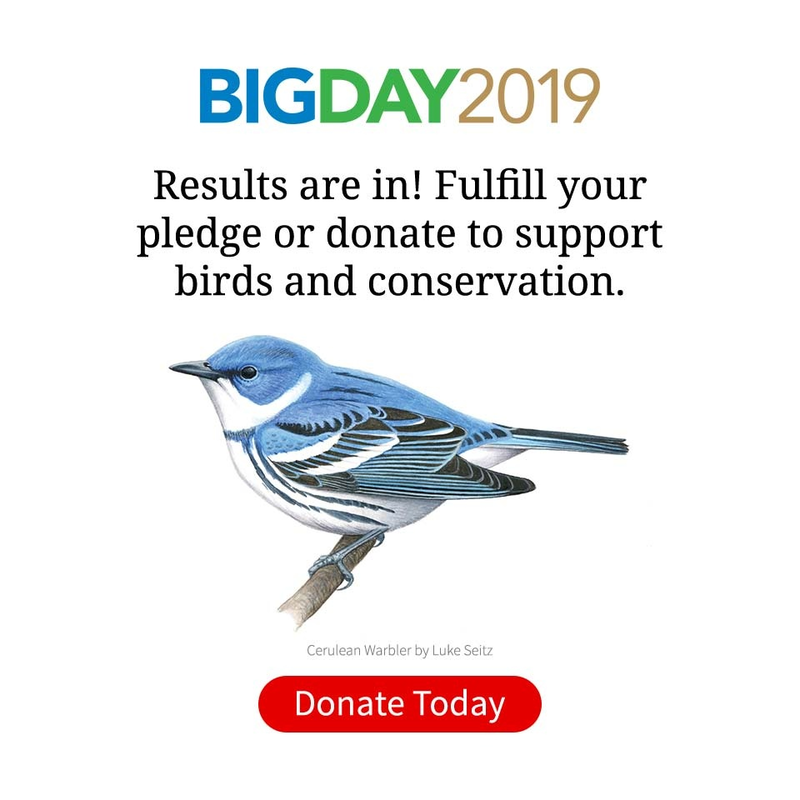 An average of 4 billion birds passed from Canada across the northern border of the U.S. in autumn, with 2.6 billion birds returning across the Canada–U.S. border in spring. Activity across the southern border was on an even grander scale: an average of 4.7 billion birds left the U.S. for Mexico and other points south each autumn, with 3.5 billion birds heading north across the U.S. southern border each spring. Radar ornithology is an emerging field that extracts avian activity from weather-radar data to track birds’ nocturnal movements. Researchers in this field employ the power of cloud computing and use algorithms to identify bird activity among meteorological phenomena, such as thunderstorms and drizzle. Scientists can then estimate flight altitude, speed, direction, and number of birds per unit of airspace using a wide assortment of radar tools along with existing knowledge of flight behavior, such as how close together migrant birds fly. Wood Thrush populations are down 60 percent since 1970. Photo by Andrew Spencer/Macaulay Library. The numbers from this study provide a measure of year-to-year bird survival. By comparing the number of birds moving back and forth each autumn and spring, researchers were able to determine an average annual return rate. For birds crossing the U.S. northern border—which includes many short-distance migrants such as sparrows, Snow Buntings, and Dark-eyed Juncos that fly from Canada to spend winter in the Lower 48 states—the average rate of return was 64 percent. But for birds crossing the U.S. southern border—which includes more of the long-distance migrants such as warblers, tanagers, and orioles that travel to Central and South America, three to four times farther than the short-distance migrants—the average rate of return was 76 percent. One explanation for the higher mortality among birds that overwinter in the U.S. may be a higher number of hazards. “All birds need to stay safe from predators, find enough food, and not get hit by a car,” says Ken Rosenberg, research coauthor and conservation scientist at the Cornell Lab. “Birds wintering in the U.S. may have more habitat disturbances and more buildings to crash into, and they might not be adapted for that.” Another reason for the disparity in return rates between migrant birds may be breeding strategy. Short-distance migratory birds appear to follow a strategy of high recruitment—that is, they have high reproduction rates that generate many offspring, so the populations can offset mortality rates. The long-distance migrant birds, on the other hand, follow a strategy of high survivorship. Their populations depend on adult birds living through the winter and returning to reproduce the following spring, even if that means expending large amounts of time and energy to travel thousands of miles to favorable wintering grounds. Ironically, this high-survivorship strategy may provide a clue as to why so many populations of long-distance migratory songbirds are declining. Tropical deforestation has continued in Central and South America in recent decades, according to the 2016 State of the World’s Forests report. Accordingly, populations of birds that overwinter in the Western Hemisphere tropics have declined dramatically, such as Wood Thrush (down 60 percent since 1970) and Canada Warbler (down 62 percent since 1970). A. M. Dokter, A. Farnsworth, D. Fink, V. Ruiz-Gutierrez, W. M. Hochachka, F. A. La Sorte, O. J. Robinson, K. V. Rosenberg, and S. Kelling. 2018. Seasonal abundance and survival of North America’s migratory avifauna determined by weather radar. Nature Ecology & Evolution. DOI: 10.1038/s41559-018-0666-4. “Longer-distance migrants seem to be gambling on having high survival in the tropics. They might be more sensitive to what happens to their wintering grounds,” noted Adriaan Dokter, an Edward W. Rose postdoctoral fellow at the Cornell Lab and lead author on the research. For the University of Wisconsin’s Zuckerberg, this study opens new doors to bird conservation—on their wintering and breeding grounds, and their travels in between. Carley Eschliman’s work on this story was made possible by the Cornell Lab of Ornithology Science Communication Fund, thanks to Jay Branegan (Cornell ’72) and Stefania Pittaluga.